Thanks to a sweetheart deal in the current Affordable Care Act, ObamaCare plans for Congress are heavily subsidized with your tax dollars, shielding them from the high-cost realities that the rest of America is grappling with. 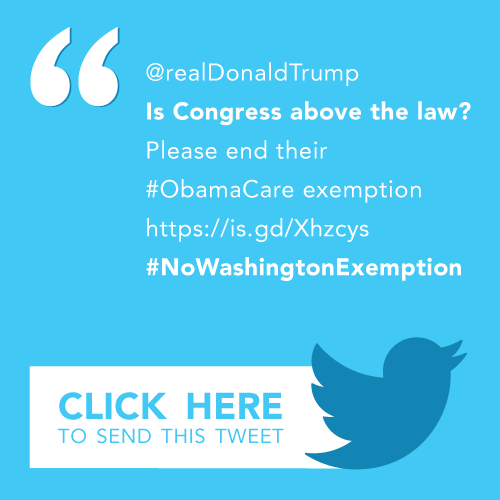 This Congressional exemption is not right, it’s not fair, and it must end now. Americans cannot wait for Congress to stop playing political games with our health care. Help us bring this to the attention of President Trump today and urge him to take action immediately. Tweet one (or both) of the messages below. Once you’ve tweeted at the President, share this with a few friends and encourage them to combine their voices with ours.